Well, today started off o.k. Got up fairly easily, went to work. It was so NICE not to have to do “getting ready for meeting” stuff and just be able to WORK. I came home to my beloved husband, which was lovely. (Poor thing had to listen to my Tale of Woe when he made the mistake of calling me when I was still about five miles from home.) Right after dinner something funny happened with the dogs, which we took pictures of. Then I realized that the upgrade I did of my budget software must have a bug in it — or I did something REALLY stupid in my data entry. Either way, my budget is now all screwed up, and I’ve lost the will to post the Funny Dog Story. Maybe tomorrow. And I’m sad (perhaps I should have started with this), because Tristan, another T-18 baby, died yesterday. He was born on Dec. 3, 2007 and had been doing so well, relatively speaking. I thank God for the 56 incredible days he had with his family… so many T-18 babies live for just a few hours, if they’re born alive. Since Poppy Joy was born on Dec. 1, there are two additional Trisomy-18 babies our little corner of the Internet has been following via their parents’ blogs. Mary Grace lived for 7 hours. Maddox lived for just a few seconds. Each of these babies is such a gift, and their parents are grateful for every second they had with their precious sons or daughters. But think about it. We’ve talked about “how long” Tristan lived. He would have been eight weeks old today. Their son’s “long” life didn’t get him to his two-month birthday. Makes my crappy day at work (and the uncertainty of what tomorrow — or any other day will bring) seem rather unimportant, doesn’t it? This entry was posted in Ramblings, Trisomy-18 on January 28, 2008 by ramblingsbyreba. You can read more about the week since Poppy Joy was born and died here. The December 7 entry includes the video shown at her memorial service. It’s beautiful. I’m also going to put it with Copeland’s video in the sidebar of this blog, should you want to look at it later. She lived only three hours, but she was so well loved. Now she’s with Jesus, who loves her more than anyone ever could. This entry was posted in Ramblings, Trisomy-18 on December 8, 2007 by ramblingsbyreba. Meet Poppy Joy and her parents Nathan and Angie. Poppy Joy has trisomy-18. She was born today at 10:26 a.m. and lived for three hours. I know of about 10 trisomy-18 families (all via the Internet, although I met Copeland’s parents at her memorial service). Each family knew of their child’s condition fairly early in the pregnancy. Each family chose to carry the baby to term and to trust God with the details. What an amazing testimony. And what courage. As I read about Poppy Joy’s birth and death to my husband, I started to cry. I cannot imagine this kind of loss. And while they would have loved more time with their precious daughter, they were so grateful for the three hours they had. And I’m glad for them. And so unspeakably sad, too, for them, and for all those who have their babies with them on earth for just a little while. Give your loved ones an extra kiss. I’m going to go up now, get into bed next to my husband, and do the same. This entry was posted in Ramblings, Trisomy-18 on December 1, 2007 by ramblingsbyreba. The memorial service was beautiful. Incredibly sad, but beautiful. 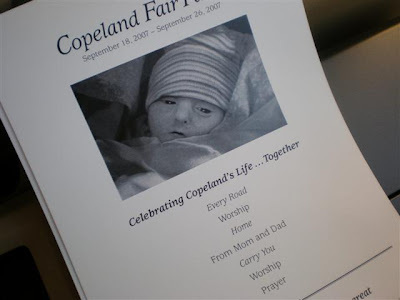 After the service, I introduced myself to Copeland’s parents and asked her mom if I could give her a hug. I told her the hug was from me and all the “blog people” who’d posted they wished they could hug her. I also met Copeland’s maternal grandparents. Copeland’s grandfather told me the family’s blog has had in excess of 300,000 hits from more than 60 countries and all 50 states. The Farley’s story has made a HUGE impact on so many people. Copeland’s mom plans to post a video they showed at the service, as well as part of the service itself, at their site in the next few days. I’ll post the link for those who are interested. In spite of the extreme sadness that necessitated it, we had a good trip. I took some pictures and will post them in a day or two. This entry was posted in Ramblings, Trisomy-18 on September 29, 2007 by ramblingsbyreba. Ed and I are driving to Brentwood, Tenn., today for Copeland Farley’s memorial service. When the alarm went off at 5:30 a.m., I groaned, said “No up!” — my traditional way of complaining about the freakishly EARLY hour my alarm goes off most mornings. Then I remembered Copeland’s family. Suddenly my having to get up so early didn’t seem like such a big deal. Copeland Fair Farley died yesterday. Click here to read about her extraordinary life. It’s remarkable that a stranger can touch thousands of other strangers as much as Copeland and her family has. I am changed in ways I may not fully understand for a long time. God bless Conor, Boothe, Sellers and all those who love her and mourn Copeland’s death. This entry was posted in Ramblings, Trisomy-18 on September 27, 2007 by ramblingsbyreba.